Back last year when the local paper decided to not replace the editor when he moved on but to go with using the editor from a nearby town. I let anyone who would listen know my feelings: I was not impressed and felt our town was being short-changed and treated shabbily. Well now I can say I have personally experienced the fallout from their decision. For those who do not know, I used to the work at the Boundary Museum when it was located downtown in Gyro Park. On the very spot where this gathering took place. I no longer work there because the museum society and city hall got into a fight. City hall closed the doors and shut the society, my employer, out of the building. Within a few months there were no longer any employees – I was the last one to go. But I stood with the rest of the museum people against the city. I was collateral damage in the fight between the Mayor, who was Neil Krog, and the society president, Rick Docksteader. So last Friday I found myself in the ironic position of standing shoulder to shoulder with the former Mayor, Neil Krog, on the ‘grave’ of the last place I was employed in this town trying to put some facts and reality in the discussion. In no published articles have I come out and stated my position on the Residential Water Meter program. Of course as a resident I have a position but as a media outlet reporting on these issues I’ve tried to maintain some semblance of impartiality. The only stances I’ve taken is to exhort the public to pay more attention to more issues with city hall than just this. And I’ve tried to point out issues that do not have bearing on the matter at hand or lack a basis in reality. That is not actually correct. I did speak, true. I did not speak for or against and the wording of the caption makes it easy to think I spoke against the program which is a mistake. And if the Editor lived and worked in this town full time he or she would know that. And I would point out that I am still not publicly declaring my position on this issue. My position should not be the point of any news topic unless that IS the topic. 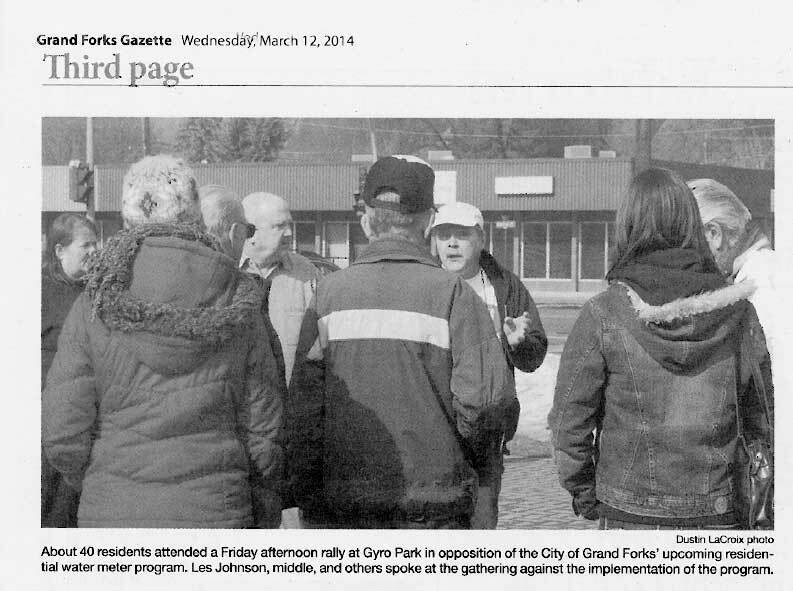 This entry was posted in City and tagged Editor, Gazette, Gyro, meters, water on March 12, 2014 by gftvboss.